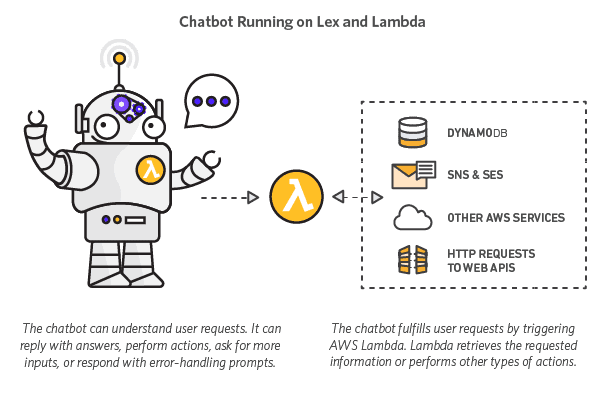 Create conversational, intelligent chatbots using Amazon Lex and AWS Lambda! Chatbots are changing how companies interface with their customers. With chatbots, you can easily fulfill the needs of your customers in an automated way using natural, human-like chat interfaces. Chatbots serve a variety of use cases, such as customer support, transaction fulfillment, data retrieval, or even DevOps functions (ChatOps). However, building and running chatbots is a difficult task. First, most developers lack the deep learning expertise necessary to create bots that can intelligently interpret and respond to text. In addition, developers must also provision, manage, and scale the compute resources necessary to run the bot’s code. What if you could build chatbots with sophisticated natural language processing and almost no operational overhead? Amazon Lex is a fully managed service for building conversational interfaces into any application using voice and text. Lex is powered by the same deep learning technologies that power Amazon Alexa and lets you build natural language chatbots. Lex is integrated with AWS Lambda, a service that lets you run code without provisioning or managing servers. Lambda enables you to write and run logic for your chatbot using serverless compute. Getting started with Amazon Lex and AWS Lambda is quick and easy. *AWS offers a Free Tier for Amazon Lex and AWS Lambda. See the FAQ to learn more. The competition welcomes submitters from most countries around the globe. However, individuals or organizations may be disqualified if they are based in a nation, state, province, or territory where U.S. or local law prohibits participating in the competition or receiving a prize. This includes individuals, who are residents of, and organizations domiciled in Brazil, Quebec, Cuba, Sudan, Iran, North Korea, Syria and any other country designated by the United States Treasury's Office of Foreign Assets Control. Employees of Amazon or its affiliates, Slack, and Devpost are not eligible to participate. Build a conversational, natural language chatbot using Amazon Lex. Use Lex’s integration with AWS Lambda to execute logic on the backend, such as for fulfilling user intent or performing user data validation. Your submission must be a new or existing bot (If existing, submitters must have updated their bot to run on Amazon Lex and AWS Lambda during the submission period). Record or retrieve data from sources like Salesforce, HubSpot, Marketo, Microsoft Dynamics, Zendesk, and QuickBooks using Lex’s pre-built enterprise connectors. Register for the AWS Chatbot Challenge. Create an account on AWS. Visit the Resources page for links to documentation and resources. Shoot your demo video that demonstrates your bot in action. Prepare a written summary of your bot and what it does. Provide a way to access your bot for judging and testing, including a link to your repo hosting the bot code and all deployment files and testing instructions needed for testing your bot. (The Github or BitBucket code repository may be public or private. If the repository is private, share access with testing@devpost.com). Bot definition files can be exported more easily using this script. Check out this Update for more information on sharing your bot. Submit your bot on AWSChatbot2017.Devpost.com before July 18, 2017 at 5pm PDT and share access to your bot, its repo and its deployment files. The extent to which the bot provides value to your users. Does your bot help solve a problem or painpoint for your users? Creativity and originality of the bot. Is your bot differentiated and does it solve your users' problems in a unique way? How well the bot was built and executed by the developer. Does the bot function as intended and does it recognize and respond to the most common phrases asked of it?